In 1497, Pope Alexander had a crisis of his own making that was threatening to undermine his ability to govern the Catholic Church. A romantic rivalry between two of his sons (he had at least six children) had become a source of intrigue around Rome. In fact, this scandal was so lurid, it was appalling even to those accustomed to flagrant immorality from the papacy. The two sons in question were Cesare and Juan, and they were both in love with their sister, Lucrezia. The plot thickened, as the Pope refused to let either of his sons marry his daughter, as he was sleeping with her himself. As the famous biographer and historian William Manchester wrote, "Even for those times, this was scandalous." When one of the sons, Juan, turned up murdered, suspicion was split between the father and brother. When Lucrezia turned up pregnant, that same divided suspicion remained. Rome had long been accustomed to assassinations, orgies, and public rioting from the Pope's family. But this scandal involved all three simultaneously, and even the public was beginning to demand change. Alexander decided he needed to marry his daughter off to a powerful Duke, consolidating the Pope's power, and ending the scandal. The daughter, wife, and daughter in-law of Alexander. In Latin it rhymed. But regardless, the third obstacle was insurmountable, and the marriage was halted when the groom was murdered by Cesare. This lead to the uncomfortable development that the Pope's daughter gave birth to a son, Giovanni, and there was no way of knowing if the father was the Pope's son or the Pope himself. By the time the child was 3 years old, his mother was 21. It became necessary politically for the Pope to marry her off, and the Pope chose the Duke of Ferrara. The new problem was that Canonical Law forbade the Pope from recognizing his own illegitimate children (only if they were fathered while he was Pope, which in this case was obvious; in fact the public labeled Giovanni "the Roman Child"). That difficulty here was notably compounded by they fact that the mother of his son was also his daughter. But…if the Pope recognized Cesare (his other son and her other lover) as Giovanni's father, then the Duke of Ferrara would likely not marry Lucrezia for fear of losing his title as Duke. If that is confusing, here it is simply: The Pope was in a Catch-22. Either the Giovanni was his, or his son's. One option was permissible legally, the other was possible politically. So what would he do? First, read/remember yesterday's post on Papal Infallibility. The Pope, deciding to legitimatize his daughter's child, issued two extraordinary bulls September 1, 1501. The first, which was made public, identified the three-year-old boy as the offspring of Cesare and an unmarried woman… The second, a secret bull, acknowledged Giovanni to be the son of the pope and the same woman. In other words, Giovanni had two fathers. And, don't loose sight of the fact that he was born only three months after the Vatican and Pope had declared his mother a virgin. That is a truly immaculate conception! 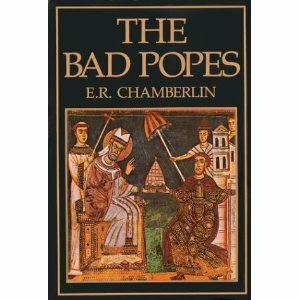 I was alerted to this story by reading E. R. Chamberlin's book The Bad Popes. Believe me when I say that this affair is not even in the top five as far as radically immoral acts committed by the Popes of that time. In fact, some of the stories were so graphic and stunning that I paused to ask myself why I was even reading them. The answer is two-fold. First, it is a powerful reminder that Luther's Reformation was not in a vacuum. Theology has consequences, and bad theology destroys lives. In this case, bad theology had the potential to destroy a continent, which it did. The dark ages were so backwards and perverse, in large part because of the rampant immorality of the Popes. Secondly, it is a reminder that the strongest argument that Catholic Apologists use today-that the Catholic Church has an unbroken chain of tradition stretching back to the Apostles-is pure fabrication. Not only is it fabrication in the historic sense (because the papacy did not being in any recognizable way until the 400's), but it is fabrication in the ethical sense. Many Popes, Luther said, "have so often contradicted themselves," and he did not simply mean on the finer points of theology. When Alexander declared his daughter (whom he had been sleeping with) to be a virgin, only to see her give birth 3 months later, Luther was 16 years old. When Alexander issued official Church Bulls declaring that his son had two fathers, Luther was 19 years-old. He entered the monastery four years later. It would be another twelve years before he posted his thesis on the church door. From that point forward, it is simply no longer feasible to maintain that Catholics and Protestants essentially believe the same things. There are substantive differences, one of which is the concept of papal authority, and another of which is the claim that the Roman Catholic Church has a glorious and unbroken continuity of being Christ's seat on Earth. They may have a tradition, but is neither glorious nor unbroken.